This exercise uses this Recipe and tools such as frequency list, a word finding service, a concordance and collocationto explore a particular theme within a text. In this example we will use William Shakespeare's Romeo and Juliet and explore the theme of love. This text is available at MIT. Use WordNet to generate a list of words related to the theme love. You can proceed in two different ways at this point. You can generate a word list and see if there are any matches, or you can start searching for the particular words identified by EVA. To explore the theme, enter each of the synonymous words as search terms using the TAPoR Find Words - Concordance Tool to explore their textual contexts. 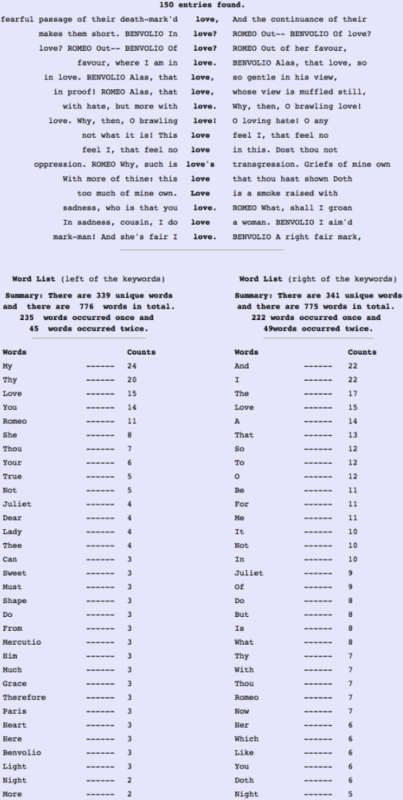 Using the TAPoR Find Collocates Tool, with the wildcard 'lov*' to get a list of co-occurring words by frequency. Use TAPoR Find Words - Concordance Tool with the words grief and love to explore this subtheme. Repeat the above step for additional words which help to eleabourate on the subtheme.